Always interesting to read the latest Russian news... much food for thought there. Agreed, much to ponder on. Operation August Storm was an excellent read. It's a pity that parador isn't around at the moment to comment. I don't think Britain will have much to say on the matter when the news becomes public. Yeah, waited several months to post that to see if he was back. Finally decided to just push ahead, as I am falling behind. One of the most notable events of Operation August Storm was the one-sided tank engagement that took place between Captain Ivan Rozhkov's lone T-47 ("Lisichka") and Colonel Balingiin Otgonbayar's column of rebel T-35 tanks from the Tank School, which took place in the vicinity of the modern Peace Bridge over the Dund Gol (Middle River) in Niislel Khuree. Prior to the engagement, Captain Ivan Rozhkov had taken "Lisichka" to spearhead the initial phase of Operation August Storm, smashing down the gate at the Genghis Khan Airport and overawing the few guards present. This allowed several Russian transports to land without incident at the airport, bolstering the assault force substantially. Although "Lisichka" had been smuggled into Mongolia with the express purpose of dealing with the Tank School's old T-35s, General Andreyev's plans had always intended to disable the Mongolian vehicles via sabotage, rather than outright action. However, due to events in the morning of August 6th, a direct confrontation became inevitable. When General Andreyev became aware that the Tank School's vehicles could not be disabled by sabotage, he immediately ordered Captain Rozhkov to take position on the most direct route into the city. Rozhkov immediately departed the Genghis Khan Airport with "Lisichka", a squad of spetsnaz troopers riding 'en dessant' on top of the T-47, and a pair of motorcyclists to warn off traffic. The group made rapid progress. Although Rozhkov departed the Airport after Otgonbayar and his battalion left the Tank School, the lone T-47 made excellent time. In his after-action report, Rozhkov attributed this to the excellent mobility of the T-47, which could reliably achieve fifty kilometers per hour on the unpaved roads of Niislel Khuree. The Mongolian T-35s, built thirteen years prior, had good mobility when driving in straight lines, but were quite difficult to steer. Rozhkov and "Lisichka" overtook Otgonbayar's column on a parallel road and thus beat the coup forces to the bridge over the Dund Gol. Although the Dund Gol was not a deep river (and could have been forded even by the T-35s), the bridge helped funnel traffic through the neighborhoods surrounding the city center. Built in 1939 by a Chinese engineering firm, it was the only road crossing over the Dund Gol with a rating sufficient for tanks. Avoiding the bridge would require the T-35s to cross the shallow Dund Gol, with the potential of vehicles becoming stuck in the mud or deep grasses near the water's edge. Arriving at the bridge at 0834 hours, Rozhkov quickly evaluated his options. He drove "Lisichka" across the bridge, turned the tank around to face south, and then backed up to wait for the arrival of Otgonbayar and the Tank School. He expected prompt infantry reinforcement from other Russian forces, but Otgonbayar and his force arrived first, at 0839 hours; Rozhkov had barely enough time to turn "Lisichka" around to face them. From all accounts, Colonel Otgonbayar was "stunned" to find his way blocked by another tank, and halted his column on the southern approach to the bridge. In spite of his surprise, Otgonbayar reacted quickly to send his aide-de-camp across the bridge, waving a white flag, with a message for the vehicle to immediately surrender. Having not educated themselves in foreign armoured vehicle developments, neither Otgonbayar nor any of his staff present at the time recognized "Lisichka" as a Russian T-47, although Otgonbayar later claimed in his trial that he knew it had to be Russian. To potentially confuse the issue, the Russians had painted the Mongolian Soyombo symbol on the tank, so that it matched the Mongolian Tank School's T-35s. Otgonbayar's demand to surrender was received by Rozhkov with little amusement, and the Russian tanker told Otgonbayar's aide-de-camp, through an interpreter, that he was serving under the authority of the Mongolian prime minister, and had no intention of standing down. He continued by ordering Otgonbayar to return to the Tank School grounds immediately and await political developments. The response enraged Otgonbayar. Although he later claimed otherwise, the Mongolian colonel probably did not realize that he was dealing with a Russian army officer. However, he fully realized that if he failed to bypass "Lisichka", then the coup was finished. He commented to his aide-de-camp "if we return to camp without the government in our hands, we are finished; we must push through." One of the Mongolian tankers nearby suggested that the immobile "Lisichka" was probably some sort of quickly-constructed dummy vehicle, meant to resemble a tank. Otgonbayar responded "even if it is real, we shall destroy it!" He then raised his signal flags, signalling the rest of the column to open fire. In the course of the next thirty seconds, the three leading Mongolian tanks, including Otgonbayar's command tank, all opened fire on "Lisichka" at an estimated range of one hundred meters. Although the 57mm/L45 guns equipped on the Mongolian T-35s had been decent tank guns in the mid 1930s, their performance against a modern vehicle like a T-47 was completely lackluster: even at point-blank range, there was no place that the 57mm guns could penetrate "Lisichka's" frontal or even upper side armor. With the Russian tank sitting back from the bridge approaches, its flanks were covered by buildings. Although the T-47 was not dug in, it turned out not to matter at all. Rozhkov had been standing in his turret at the time, and quickly dove inside, being injured on the hand by shell splinters. He had not expected the Mongolian tanks to open fire quite so quickly, but he had an immediate response ready, and ordered his gunner to destroy the lead T-35, where Otgonbayar was standing in the turret, watching the engagement. While the old T-35s could not damage "Lisichka", Rozhkov's tank, with its 100mm gun, was more than capable of penetrating the T-35's armour at any range. The first round from "Lisichka" hit Otgonbayar's T-35 on the upper glacis, penetrating the armor, killing the driver and radio operator, and severely wounding the gunner and Otgonbayar himself. Moments later, the T-35's ammunition caught fire and the tank 'brewed up'; Otgonbayar and his gunner managed to escape only by rolling themselves out of the vehicle. Colonel Otgonbayar, badly wounded in both legs, crawled about thirty meters before he passed out. The remaining Mongolian T-35s continued their ineffective barrage against Rozhkov's tank. Because they were still in column formation, only the front 2-3 tanks had a clear line of fire; they continued firing. In the aftermath of the engagement, Rozhkov and his crew counted sixteen impact spots on the front of their T-47. Some of the Mongolian tankers further back in the column, unable to see their target, did not even know who was shooting at them, or why Otgonbayar had opened fire. When the shooting continued, Rozhkov had his gunner target the second Mongolian T-35, which was heroically pumping shells into the T-47's frontal arc. The "Lisichka's" second round again punched easily through the T-35's armour. All four of the vehicle's crew bailed out successfully, although with severe injuries. Several minutes later, the vehicle's ammunition exploded, throwing the tank's turret into the air. Rozhkov ordered a third round fired at the third T-35 in column, but thick smoke and fire from the first two burning vehicles forced the gunner to miscalculate the shot, which hit the turret roof of the third T-35. The round killed the vehicle's commander, Sergeant Mönkhbat, who was leaning out of his hatch attempting to spot "Lisichka"; but the tank remained operational and the Mongolian gunner continued blindly firing at the T-47, scoring several more ineffective hits. With thick smoke now covering the area, Rozhkov ordered his driver to advance slowly toward the Dund Gol bridge in an attempt to spot the remaining tanks. Rozhkov knew he was still receiving fire (from Mönkhbat's tank) but he was unable to see the source of the rounds. As "Lisichka" moved forward, it was struck a final time by Mönkhbat's tank gunner. As the firing continued, the Mongolian tankers quickly realized that the tank they were facing was apparently impervious to their smaller-caliber weapons. None of the tanks were equipped with radios, and with Colonel Otgonbayar out of the fight, there was no clear officer in command. Reactions depended largely on the fortitude of the individual tank commanders and crews, but by and large, the majority of the commanders elected to quit the fight. The same held true for most of the motorized infantry that followed the tank column, which rode in trucks or "en dessant" on the tanks themselves. Many of the soldiers threw down their weapons and stripped off their uniform jackets as they fled, leaving the street littered with equipment. The crew of the fourth tank in column, commanded by Sergeant Ihbarhasvad, fired several rounds at "Lisichka", but were unnerved by the disaster unfolding ahead of them; Ihbarhasvad ordered his crew to bail out of the tank and take cover. Ihbarhasvad was just helping the driver out of his hatch when the smoke momentarily cleared, allowing Captain Rozhkov to spot targets again. The tank was hit by a 100mm anti-tank round, throwing Ihbarhasvad and his driver to the ground, stunned but only lightly injured. At this point, Rozhkov thought he'd knocked out all four tanks, but continued to see muzzle-flashes coming from Mönkhbat's tank (although no further hits were scored). After a few more minutes of drawing ineffective fire, Rozhkov's gunner spotted Mönkhbat's tank largely intact, and put another round into it, killing the tank gunner; however, the driver and radio operator had already bailed out, escaping without injury. One tank commander in the middle of the column, Lieutenant Puntsagiin Tsakhiagiin, commanded his driver to break through a side street in an attempt to outflank the T-47. Tsakhiagiin managed to clear the main avenue and tried to cross the Dund Gol to the east of the bridge. However, as the T-35 rolled down the slope toward the river, it nosed down into the shallow water and became stuck. Tsakhiagiin tried to back his tank up, but the T-35's reversing gears became jammed. As his tank had drawn too much attention, Tsakhiagiin ordered the crew to bail out and hide in the grass nearby. Although Rozhkov did not notice Tsakhiagiin's T-35 stuck in the riverbed, some of the dismounted Russian troopers who sheltered behind "Lisichka" noticed Tsakhiagiin's vehicle. Corporal Vladimir Dambaev, who was carrying a new RPG-2 launcher, did not see the crew abandon the vehicle, and fired two rocket grenades at Tsakhiagiin's tank from a range of about seventy meters. The first rocket hit one of the tank's road wheels, but did not penetrate the fighting compartment, while the second hit the side of the engine compartment, starting a fire that eventually consumed the tank. 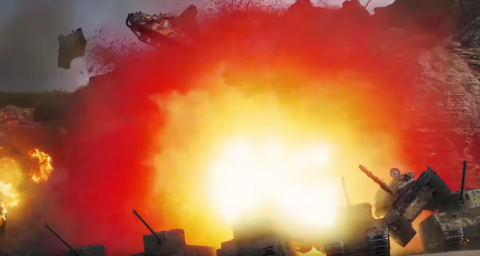 By this point, almost all firing had ceased. Five of the fourteen T-35s were destroyed or in flames, and the Mongolian crews had largely abandoned the remaining tanks. The commander of the last vehicle in line, Sergeant Luvsan, backed his tank two hundred meters down the main road, but at that point ordered his crew to abandon their vehicle, as abandoned trucks blocked any further retreat. Luvsan and his crew walked across the street to a restaurant, sat down at a table, and waited for the victors. Despite the exchange of fire, there were relatively few casualties, mostly on the side of Otgonbayar's troops. Six Mongolian tankers were killed and six more wounded. On the Russian side, Rozhkov was minorly injured, and one of the spetsnaz troopers suffered a broken wrist when he tried to take cover. Additionally, some of the 57mm tank rounds that missed 'Lisichka" (or were deflected by its armour) hit a nearby apartment block, causing injuries to twelve civilians. More Russian spetsnaz troops arrived at the scene over the next three hours, joined by a small number of Mongolian policemen; they began picking through the column, gathering dropped weapons and rounding up many of the soldiers and tank crews who hadn't completely fled out of the area. The wounded Colonel Otgonbayar was discovered near the head of the column, and treated by a Russian medic who recognized his uniform. Combined with the capture earlier that morning of the coup leader, General Udval, Otgonbayar's arrest largely terminated all potential for resistance by the remaining pro-China faction. In the aftermath of the engagement, Captain Rozhkov, inspecting the captured Mongolian vehicles, voiced the opinion that the events at Dund Gol Bridge were "less a battle and more of a massacre". General Andreyev, in his own reports, agreed that in the confined urban battlefield, the T-47 was "absolutely impregnable to its opponents' fire" but highly commended Rozhkov for his selection of terrain. Added the above with a more detailed account of the tank incident during Operation August Storm. 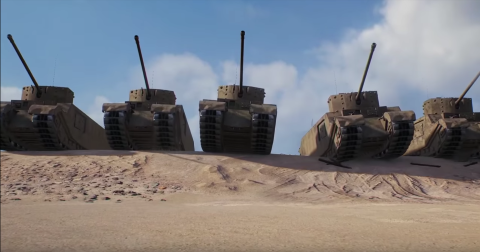 Pretty much boils down to "new tank curbstomps old tanks." Shouldn't be much of a surprise. 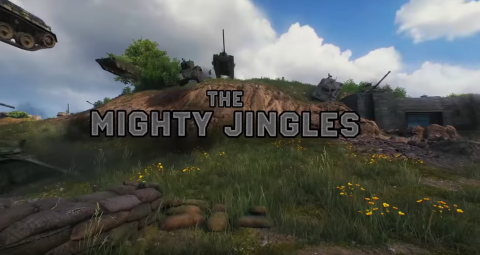 Jingles: Howdy folks, and welcome back to World of Tanks with the Mighty Jingles! Jingles: I got this replay in my inbox a few days ago, and I have to admit, I nearly didn't watch it. But something in the description caught my eye, and oh boy am I glad I did watch it. Jingles: This is... Yeh... yehosh... okay, I'm not even going try to pronounce his name. Let's just call him Dave. Jingles: Yup, it's the return of Dave! He sure does get around a lot - I mean he was in yesterday's World of Warships video, and I think we saw him last week, too. Dave, how do you find the time? Jingles: Today, Dave is driving for us on the 'Mongolia' map the brand-new limited edition tier eight Russian premium medium tank "Lisichka". Try saying that one five times fast. Jingles: What is 'Lisichka', you say? Haven't seen it in the gift shop? Well, that's because it's only available on the Russian server. Jingles: The 'Lisichka' looks pretty similar to one of the other tier 8 Russian medium tanks, the T-47 Tsiklon. And that's because it IS a Russian T-47 Tsiklon. Jingles: There aren't many differences between 'Lisichka' and a T-47, admittedly. The tank doesn't have the track covers installed, which means that it lacks a little bit of that spaced armour that can protect the tank while it's sidescrapping. Jingles: But it compensates for that minor issue with a slightly better gun. Jingles: The only other difference is the paint job - which looks pretty dull, aside from that fox on the sides of the turret. Jingles: Is that it, Jingles? If that's all it is, why should I want to buy one? Jingles: What, are you blind? It's basically a premium T-47 Tsiklon, which is still one of the best tanks at tier 8! Jingles: According to his email, Dave has just purchased this tank, and he's out for his first battle in it. Jingles: "Hey guys, look at my new tenk! Do you like my new tenk?" Jingles: What I suspect has happened is that Dave might have complained once or twice too often about the matchmaking. Jingles: Matchmaker has gotten sick and tired of it. "Alright Dave, you say how useless your teams are. Let's see you back those words up. Let's see how you do when your team is not just incompetent, but not even there." Jingles: Oh boy. Well... this will be interesting. Jingles: The moment the countdown timer ends, Dave puts his tank in gear and gets moving. Jingles: To be honest, the match actually starts out a little slow. Jingles: Dave sets off across the Mongolia map to look for the enemy team, but initially, he doesn't seem to have much success. Jingles: He starts by heading toward the airport in the southwest corner of the map, but there's nobody to be seen. Jingles: So he starts retracing his steps, headed for the center of the town. 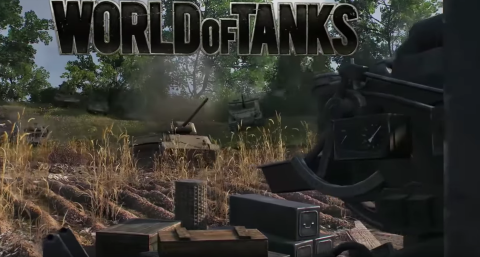 Jingles: I remember back when Wargaming first introduced the Mongolia map, it was a really wide open map that was perfect for light tanks, tank destroyers, and fast mediums. Jingles: But over the years, the map has seen a few changes. First, they added a town in the middle; and then the town council declared that they had a spot of urban growth, and now it's almost entirely city, perfect for those heavy tanks, with corridors that are perfect to avoid being outflanked. Jingles: ...wait, are those two AFK T-35s? Jingles: That's a tier 4 tank! Jingles: So it turns out that matchmaker wasn't just trying to spite Dave. Jingles: What actually seems to have happened is that matchmaker went out last night to the pub to party with some friends. Jingles: And after a drunken all-nighter, matchmaker has returned to work claiming absolute sobriety even as it's downing another shot of vodka. Jingles: Just look at that enemy team. 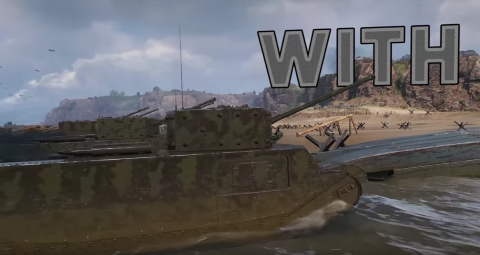 Jingles: So while Dave didn't apparently rate any teammates, matchmaker has decided to give the enemy team sixteen T-35s. Jingles: What has, in fact, happened, is that Dave has brought a tier 8 premium tank to a tier 4 battle. Jingles: ...why can't I have matchmaking like this? Jingles: So doubtless rubbing his hands together in anticipation, Dave continues hunting for the enemy team. Jingles: And as he drives across the bridge in the center of town, his sixth sense goes off. A moment later, he spots the enemy team. Jingles: He gets the tank across the bridge and turns around. And the entire enemy team - except for the two AFKs - are all RIGHT THERE. Jingles: Well, things could be worse. Jingles: Yes... and if Dave was on the old Mongolia map before it was industrialized, he might have been in danger, because the enemy team could have surrounded him, and fired into his tank's weakly-protected rear. Jingles: However, in the current situation, Dave's able to point the front of his tank at all of the enemies. And they can't outflank him. Jingles: And by the way, did I mention that he's in a T-47, a medium tank that's fairly well-regarded for having some pretty good armour, even at tier 8? Jingles: Those T-35s are decent tier 4 medium tanks, but their guns aren't even capable of penetrating Dave's side-armour. 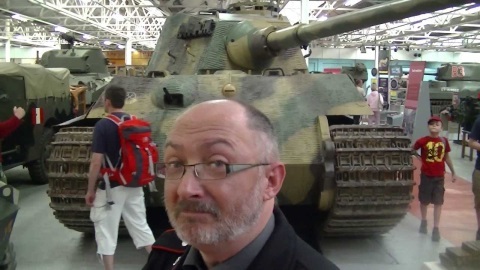 Jingles: I've got to feel sorry for those T-35 players on the enemy team. I mean, some of them have only been playing the game for a couple of hours, at most, and suddenly, the drunken matchmaker sends them up against this thing. Jingles: And Dave is so busy laughing that he lets the enemy team get the first few shots off. I mean, what's the harm? Jingles: Dave just lets them have their turn while he takes his time aiming on the lead tank and... BOOM. Jingles: AaaH ha ha ha ha ha haa! Jingles: (Russian accent) "Hello comrade, look at my new tenk! Do you like my new tenk?" Jingles: ...I shouldn't be laughing, it's not funny. Jingles: Dave blows away the second enemy with a second shot. Jingles: Next shot. BOOM! ...wait, that was a really unfortunate damage roll. Dave leaves the T-35 alive, on a sliver of health. Jingles: I've lost count of how many times Dave's been hit, but he's not taking any damage. Jingles: Dave doesn't seem to realize that he didn't kill the third tank, because he's lined up on the fourth. BOOM, another one-shot kill. Jingles: And the enemy team just doesn't know what to do. Jingles: They've all lemming-trained up the road together. Actually, that's a surprisingly good bit of teamwork... but it's not going to help them, especially now that they're trapped in the corridor facing a tier 8 tank. Jingles: They're just sitting ducks. Jingles: You can see them in chat. "OMFG Russian tanks OP plz nerf!!" "Please stop, we surrender." Jingles: I won't draw this out longer... I mean, look. The enemy team has just had enough. Half of them just decide to give up and go AFK, while the other half are just stuck in place. Jingles: There's only one player who's still trying to fight, and he... yeah, look there. He's trying to flank Dave's T-47... but he can't even do that right. Jingles: Watch him as he attempts to drive across the river. Jingles: "Doo de doo de doo... derp!" Jingles: "I seem to be a little stuck." Jingles: "Well, okay. 'Screw you guys, I'm going home!'" Jingles: And that's how it ends. Jingles: Check out Dave's medals. Jingles: Cool-Headed, Scout - for spotting pretty much the entire enemy team; Kolobanov's Medal, of course, for standing alone against five or more enemies and winning. Of course, Steel Wall. And pretty much the easiest Raseiniai Heroes Medal I've ever seen. Jingles: So congratulations to Dave... but... let's be honest, this probably wasn't because of skill. Jingles: Take care, folks, and I'll see you next time. Bravo! Nicely done. See what you can do when you channel your inner Jingles? Captain Third Rank Yakov Leontiev looked at his charts. His submarine was fifteen nautical miles north of the Nordish island of Gotska Sandön, creeping along at two knots on the dregs of its batteries. The air was stale and dank, over-warm, and smelled of sweaty men. Overhead - not very far overhead, unfortunately - a Nordish frigate meandered around, its elderly active hydrophones trying to find S-9. The Nordish set was old enough that it's sound came out more as a donk-donk rather than a sharply modern ping-ping, but the Nordish skipper persisted in spite of his mediocre gear. "Battery at five percent," S-9's engineer reported. Yakov sighed and wished he hadn't: he got a lung-full of air that tasted of wet socks and worse. "Surface the boat; all stop." S-9 surfaced, her deck glistening in the afternoon sun, and Yakov popped the conning tower hatch to glare at the Nordish F32-class frigate, which circled around, halted, and lowered her whaleboat. "Oh, I know this clown!" Yakov said to himself. The Russian submariners - as many as could justify it - climbed out on S-9's deck and helped the Nordish whaleboat as it nudged the side of the submarine's hull. A man in the uniform of a Nordish commander asked for and received permission to board, carrying a case of Swedish beer. "Our Russian friends!" he said cheerily. "We meet again!" Yakov climbed down out of the conning tower and switched to broken Swedish. "It's you Finnish jokers! Don't you have anything better to do than bother honest Russian submariners?" The Nordish commander grinned. "Why, if ever I find an honest Russian submariner, I'll make sure to leave him alone! How are you doing, Yakov Ivanovitch? ...God, you smell like you've been rolling in farts." Yakov grinned, and gave the Nordish commander a manly hug with an enthusiastic back-slap. "Mika, you pirate, you did this to me. First the fog this morning, and then your rusty frigate shows up! Held me down for six hours on the last of my batteries! All I wanted to do was sneak into Stockholm..."
Commander Mika Runeberg grinned and lit up his pipe. "It's good to see you again, Yakov. How's the wife? Still pretty as before?" "Da," Yakov said. "How are the kids?" Runeberg rolled his eyes. "The youngest is walking, now... well, running. I have to take my rusty frigate to sea in order to get any sleep!" He snorted. "I'm glad to see you, though, Yakov Ivanovitch. You probably won't see me in the Baltic again for awhile. Promotion, you see - they want me in Trondheim in two months." "Congratulations, Mika!" Yakov said, slapping the Nord on the back again. "But why the long face? Are you not happy with your new command?" "My new command is a desk, Yakov!" Runeberg said, with not-entirely-feigned dismay. "Hopefully I'll be back to Helsinki in another two years, but I probably won't be able to come out and play with you, uh, 'honest Russian submariners' when I do." "Oh, well," Yakov said. He shrugged and snagged two of the beer bottles that Runeberg brought with him. "We'll drink to you, then, Mika Runeborg!" The two captains drank and tossed the empty bottles over the side. "It's a shame," Yakov continued. "You've wrung a reputation out of that rusty frigate of yours. I heard you bagged S-4 a month ago. Vasiliy Igorovitch was lived." Mika Runeberg's grin returned. "You need new boats. That S-4 is the worst of them. At least your lads here in the 'Nine' keep everything lubed and greased. Don't tell anyone, but I actually lost you twice earlier this afternoon. I was lucky today, and you were unlucky." "Oh, we'll get new boats soon enough," Yakov said. "Last week I saw one of the new 'Kosatkis' heading out for trials. Mika, my friend, let me tell you, if I had one of those beauties, I'd have given you the slip five times over today. But you lot over on the west shore need new boats, too. Have you heard your hydrophones recently? You'd be better served by a five-year old smacking a metal pan." Runeberg chuckled. "Yakov, my friend, I should take you to the Admiralty with me as an expert witness. Maybe someday soon the Riksdag will stop blowing our money on beer and trashy women, and we can get back to the modern age." He puffed thoughtfully on his pipe. "But if you get the chance, Yakov Ivanovitch, you ought to drop by Trondheim." "Maybe sometime. You ought to drop by Tallinn." Runeberg shrugged. "Maybe sometime." He watched as his crew loaded several cases of vodka into the whaleboat, exchanging them for Swedish beer on a one-for-one basis. "I suppose I ought to head back to my rusty frigate, Yakov Ivanovitch." "You take care of yourself, my friend. Don't let your rusty boat sink before you get back to the pier." "Take care of yourself!" Runeberg said. "Don't let your smelly little submarine sink... well, sink unintentionally! Remember, surfaces must equal dives..."
As the whaleboat motored back towards the Nordish frigate, Yakov climbed back up into the S-9's conning tower. "If we had one of those new Project 86s," he said, raising his voice over the rumble of the boat's diesel engine, "we'd have gotten away with it." S-9's second officer shrugged. "I suppose we'll get some of the hotshot destroyer drivers to run down one of their boats in repayment, sir." "Da; remind me to take it up with Captain Tumansky when we return to Tallinn..."
Nice work! Plenty of giggles in that piece.